Citation: C N Trueman "Thomas Wintour"
historylearningsite.co.uk. The History Learning Site, 17 Mar 2015. 12 Apr 2019. 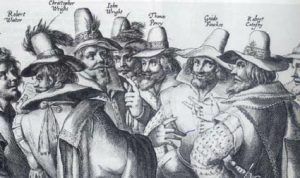 Thomas Wintour was one of the conspirators in the 1605 Gunpowder Plot – the attempt to kill James I and as many members of Parliament as was possible. Thomas Wintour paid for his role in the plot when on a cold January morning in 1606 he was executed. Thomas Wintour was born in 1572. His father, George, was tolerably well off as he owned hop yards and twenty-five salt-evaporating pans in Droitwich. The close knit Catholic community meant that he would have known the other men associated with the plot – and he married Elizabeth, the sister of Robert Catesby. In 1603 Wintour went to Spain, along with another of the conspirators, Christopher Wright, in an attempt to get Philip III to provide support and aid for a planned Catholic uprising. It came to nothing. It was Robert Catesby who recruited Thomas Wintour, and his brother Robert, into the conspiracy. The plotters had worked out what to do if their plan failed. When it became known that ‘John Johnson’, Guy Fawkes, had been apprehended in the cellars of Parliament, those waiting in London itself fled the city. Their plan was to meet at Holbeche House. On November 8th, men who were with the Sheriff of Worcester surrounded the manor house. The conspirators were surrounded by armed men but refused to surrender – almost certainly as they knew what fate awaited them if they did surrender. A firefight broke out that killed Catesby and Christopher and John Wright. However Wintour was captured and sent to London. He was imprisoned in the Tower of London along with Guy Fawkes, Ambrose Rookwood and Everard Digby, amongst others. After a brief trial in which Wintour pleaded not guilty to treason, he was found guilty and sentenced to be hung, drawn and quartered. On January 31st 1606, Wintour along with the other plotters was taken to Old Palace Yard and publicly executed.